Not all money clip wallets are created equal. If you’ve been searching for one, it’s time to take a look at our buying guide to help you choose. We’ve done our research to bring you the top, best-performing money clip wallets that we could find based on a variety of factors that we’ll go over below. If you want the best wallet for your money, we’ve got you covered. Here are some things you should keep in mind. Materials: What is the wallet made of? Some are made of leather, while there are a select few wallets that are made of metal or carbon fiber. This is based mostly on your personal preference, so choose the one you like! 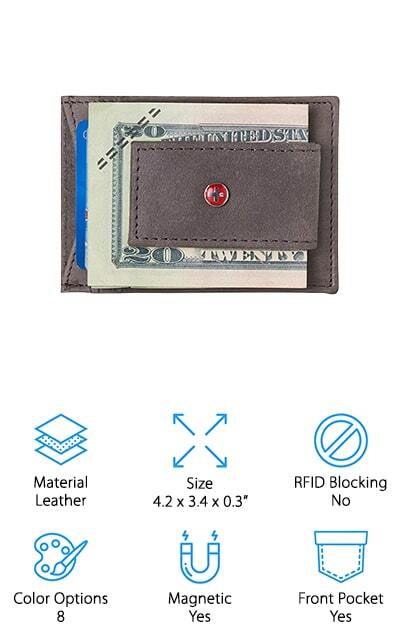 Size: This will tell you the dimensions of the wallet, which is useful in determining if it will hold all of your stuff. It can also tell you if it will fit in your preferred pocket. It’s important to know! RFID Blocking: RFID is a type of technology that hackers and identity theft perpetrators use to get the information off of your credit cards. RFID blocking wallets keep that information right where it belongs: with you, so your finances are safe. Color Options: How many colors does the wallet come in? Natural leather colors or natural metals are the most numerous, but you can also find a lot of bold colors on this list. Choose what you like! Magnetic: Is the wallet magnetic? This refers mainly to the money clip that will be attached to the outside of the wallet. If it uses a magnet to keep your bills safe, it’s generally more secure for your money. Front Pocket: Can the wallet be carried in your front pocket? This is important for some people who are tired of sitting on a bulky billfold. Instead, switch to a slimmer design you can stow in your front pocket. So what is the best wallet with a money clip? It really depends on what you’re looking for. We’ve compiled a list of the best so that you can make your own decision about which you like better. Our top pick and budget pick are great places to start, so check them out before looking through the rest of the list. Keep your money safe and close to you with these amazing money-clip wallets. When you want to carry around only the important things, check out the best bifold money clip wallet that we found during our research. The HOJ Co. Deacon Money Clip is great for a simple man who only wants to have the important things, but also wants the traditional bifold as well. Hold just as much as you need to without the bulk. You can carry it in your front pocket or your back pocket – it’s entirely up to you. 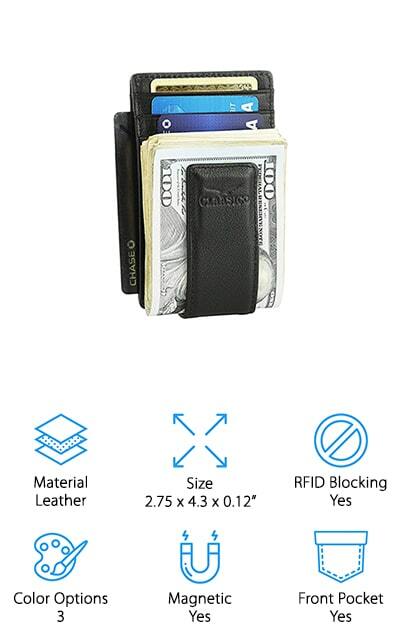 This wallet is made of genuine leather and features RFID blocking technology, so you can wear it without fear of your information being lifted. It includes an antique silver money clip that clamps shut to securely carry bills outside of the bifold. The wallet is lined with a plaid material that adds a nice, stylish touch to this masculine piece. Plus, there are 9 total card slots so you don’t have to decide between your cards. 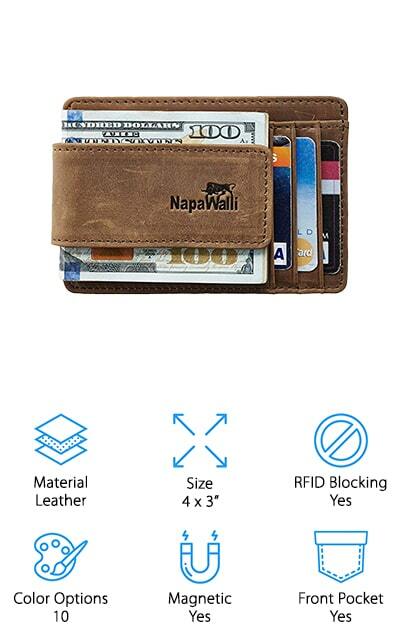 If you need the best magnetic money clip wallet on a budget, go with the NapaWalli Money Clip Wallet. It uses four extremely tough Rare Earth magnets to make sure that your money stays right where you want it to. It’s made entirely of full grain leather, with high-quality detail stitching and card holders that will grip onto your hard earned cash as hard as you do. It fits in your front pocket or a back pocket – it’s up to you where you put it. There are three card slots, two larger slots for other things, and an ID holder with a quick-access window so you can slide your ID out. The place where this wallet really shines, though, is in the RFID blocking technology. The frequency that credit cards use is completely blocked from outside the wallet. However, you can still use a proximity card for your job or keyless entry situation without compromising your security. Travando offers this slim wallet with five different card pockets, which includes four safe inner pockets and an easy-access pocket on the front for your ID or the card that you use most often. The outside notch makes sure that you’re spending less time fiddling with your wallet and more time on the go. 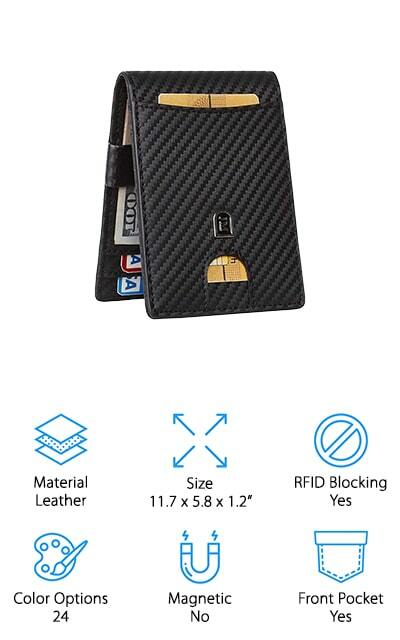 Your data is safe with this wallet as well, as this wallet has blocking panels for data-lifting technology. No one is going to be able to read anything from your wallet no matter how hard they try. It includes a metal money clip that allows you to store several bills at once while still cutting a pretty slim figure. The leather and all other materials that have gone into making this wallet are top-notch, and we know that you are going to love it. Don’t be bogged down with unnecessary cards and other items when you can go with this slim, functional wallet. This sleek wallet by Alpine Swiss is a great solution to your bulky, oversized wallet. It’s one of the best money clip wallet combos on our list, made with quality materials and peerless leather craftsmanship. Alpine Swiss is a well-known company with great feedback, so you know they take their job seriously. 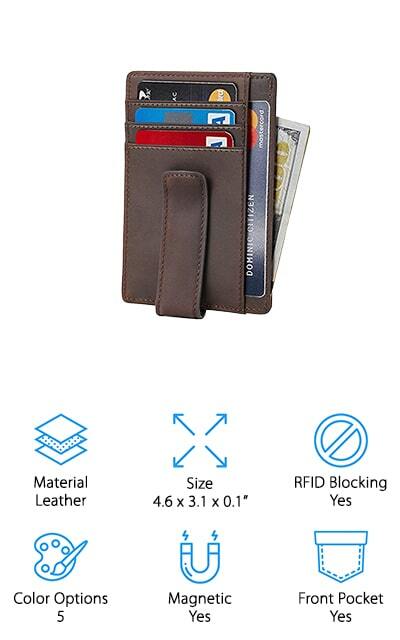 This wallet is slim enough to carry in your front pocket and has three slots for cards, as well as a front ID window with a cutout to slide your card out easier. Folded cash can be stored via the magnetic clip that will hold onto your money as tightly as you do. There are so many unique colors that we can’t help but love this wallet. Whether you want a traditional leather color or a bright blue, this wallet has you covered. It’s rugged but soft, and it’s going to last you a long time. We’re sure that you won’t ever go back to a bulky wallet. 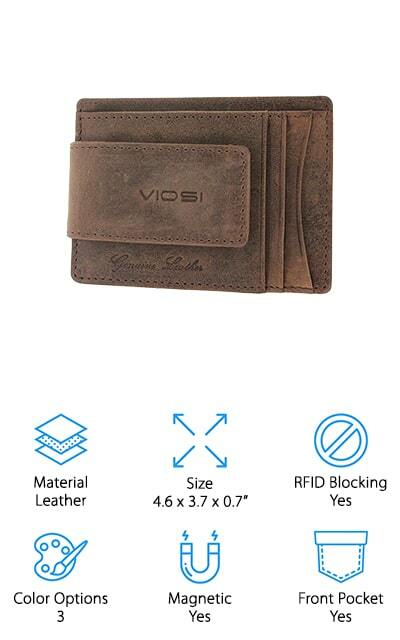 Viosi makes one of the best leather money clip wallets with this product. There are three different color options available, so you can fine-tune the look of your wallet to the rest of your aesthetic. The wallet itself contains three card slots, meaning there are two larger slots and a slot specifically for your ID. You can pop it out easily with the cut-out, so you won’t have to fumble again. This wallet is the traditional 4” by 3” that allows it to slide perfectly into your front pocket if you don’t want to be sitting on it. The use of two extremely tough magnets to keep the money clip potion closed makes sure you keep everything you earn. This is a simple wallet, but that doesn’t necessarily mean that’s a bad thing! Plus, it blocks RFID data-lifting frequencies to keep your identity safe from hackers and other people with bad intentions and technology on their side. Classico’s Money Clip Wallet is a great gift for the simple man in your life! It’s an ultra-slim construction of genuine leather is great for whatever pocket you want to put it in, including your front pockets. It’s soft, but that doesn’t mean it can’t take a beating. It’s smaller than some of the other wallets on our list and contains 4 card slots as well as a front window ID holder and a center bifold to put your bills in it, or even your additional cards if you need more. The RFID Blocking is advanced and blocks the frequency from credit cards so they can’t be read from outside the wallet. However, it doesn’t block the frequency from work and hotel passes, or access cards. You can still use it to get inside without affecting your credit cards. It’s a beautiful clip wallet that you’re sure to love, especially if you only have a few cards to carry around. This money clip wallet by Travelambo comes in 18 amazing colors, including blue, yellow, purple, and green leather. It even comes in red and neutral colors, as well as all of the neutral leather colors. 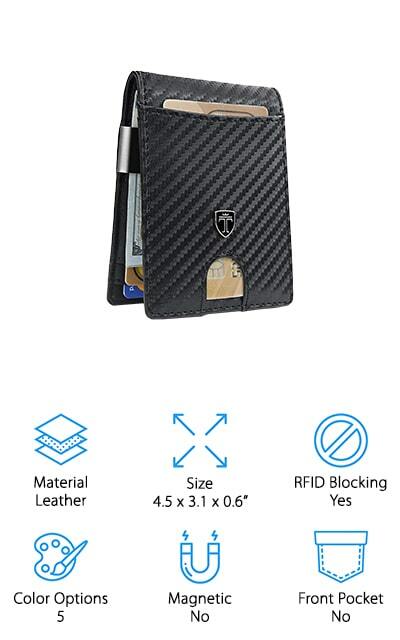 It’s made of high quality of cowhide leather and includes RFID Blocking to keep credit card frequencies safe inside your wallet and not readable from the outside. 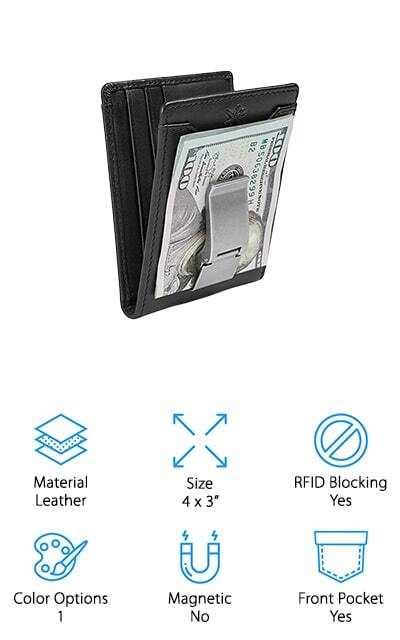 There are three card slots in this wallet for your most important or frequently-used cards, including 1 ID window that you can easily get your card out of and a magnetized money clip to keep your cash safe and attached to you. It includes a one-year warranty so if something goes wrong in the production or delivery, you can get a refund or a free replacement: the choice is yours! We love all the different stylish color options for this wallet, as well as how slim and comfortable it is to use. JM makes this bifold money clip wallet that can hold all of your important cards and your money as well. There are six inner slots for your most important cards and the ones you use most often, as well as an outside pocket for access to the card that you use more often than the others. The money clip on the outside can hold up to ten folded bills. It has RFID blocking technology to make sure your credit cards can’t be read from the outside of your wallet. Keep your privacy safe and your money right where it’s supposed to be. Plus, it comes in gift-box packaging so that you can easily wrap it up and give it to the man in your life as a gift. Plus, there’s a 12-month warranty where you can get a refund or replacement if there is something wrong with your wallet either in design or manufacture. We love it! Beartwo makes this leather money clip wallet with 100% genuine materials. This means that it’s a durable, smooth wallet that’s going to last you forever. It’s classic and is made with solid stitching to get you through anything. It’s thinner than your other wallets, which makes it lightweight and compact as well as convenient. It’s got advanced RFID technology due to the unique metal composite shield that it uses, so your information stays private. 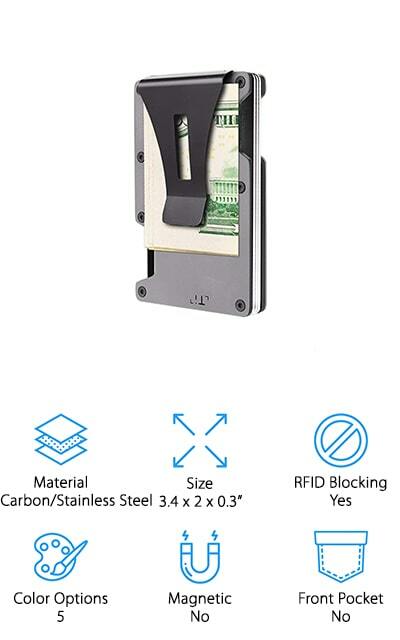 There are 8 card slots on the inside, as well as one ID window for your license as well as a clip to hold onto your cash with a powerful magnet to make sure it stays that way. The magnets are not strong enough to impact your cards or phone, so don’t worry! Giving it as a gift? It comes with its own gift box when you order, so you can wrap it up right out of the package. You’re going to love it! IKEPOD makes the only metal produce on our list. 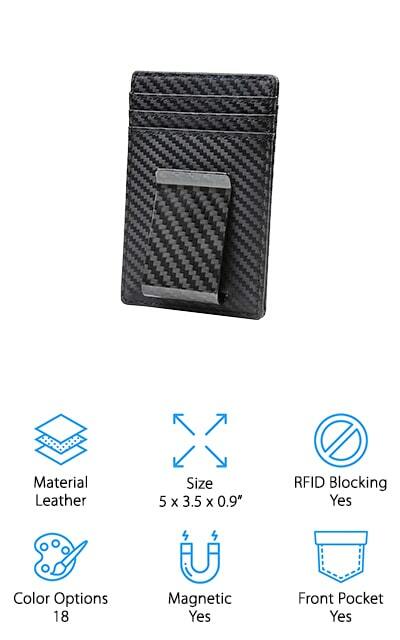 It’s a carbon fiber money clip wallet that also uses stainless steel and titanium alloy to get a protected, stylish design that you’re going to love carrying around. It’s a minimalist design that you can wear in your front pocket and is perfect for use every day as well as on special occasions. This titanium money clip wallet design is lighter than steel, so you’re getting a wallet that won’t weigh you down either. It will resist RFID waves to keep your information private. You can carry between 4 and 12 different cards and IDs, as well as bills on the outside money clip. Plus, the 3-year guarantee makes sure that you’re going to love it and that it’s going to keep working under normal usage. There are five different colors or finish options for your metal wallet. Cut an intimidating figure no matter which you choose!